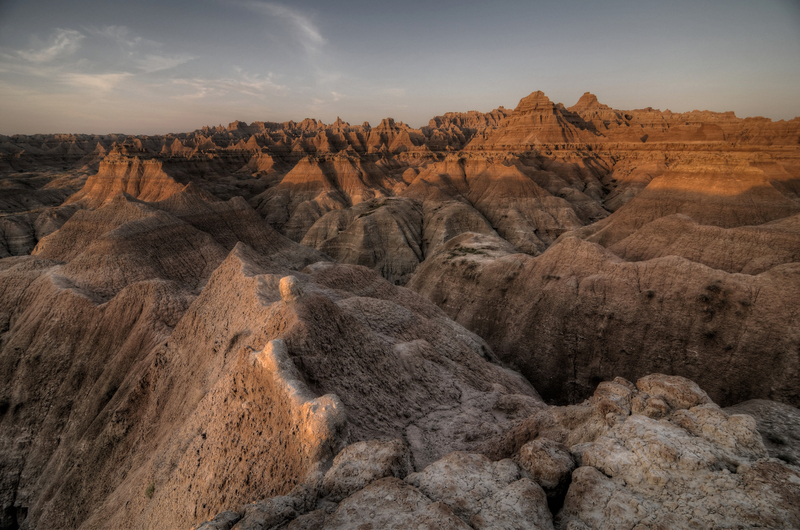 I recently read an article that placed the Badlands in the Top 5 worst National Parks. 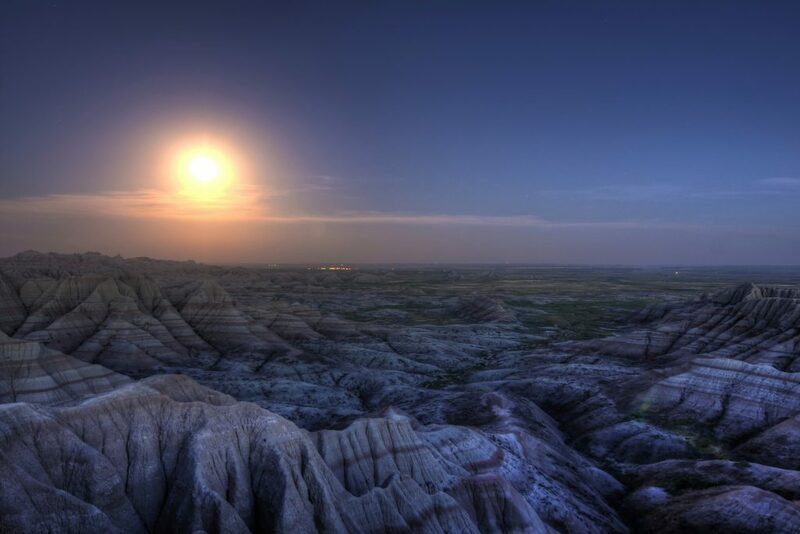 I can’t say the Badlands is my favorite National Park, but it is far from the worst. The park is easily accessible. There is so much to see just a short walk from the pullouts along the road. The various overlooks along the main park road are picturesque. 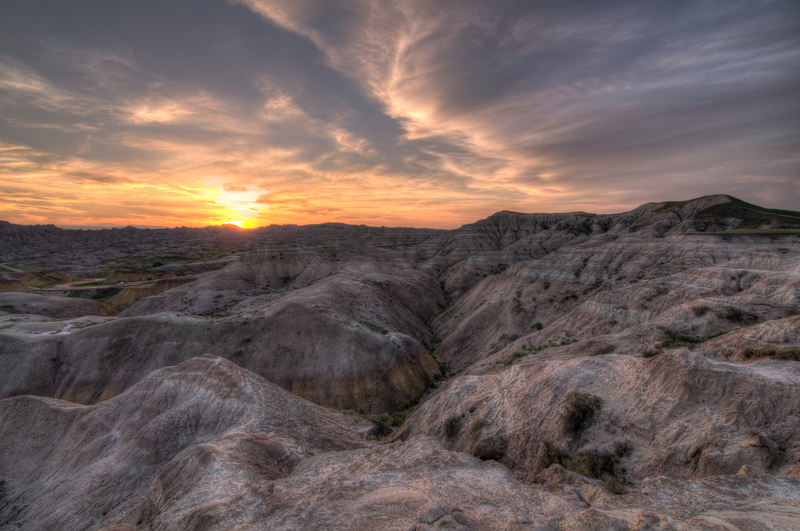 To really see the Badlands though, you need to take one of the park’s shorter, more popular trails. 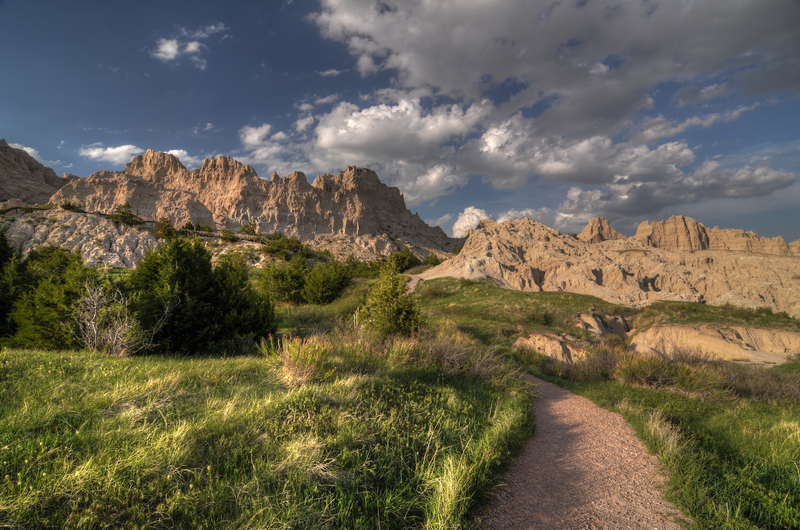 A half-mile hike down the Door Trail will put you in the center of the true Badlands. The 36 hours I spent in the area was my favorite part of a 5 day grand loop around North and South Dakota. If you like color in your photos and you’re getting sick of green, this is the place. You can find red, yellow, orange, and beige everywhere. And when you’ve had enough erosion, there are simple, beautiful grasslands all around. I was there for two sunsets and two sunrises and while there’s plenty more I could have done, I felt fulfilled in this trip. I spent my whole time in the Badlands in the Northern section of the park. There is a whole other world to the southwest of the area in the map below. For what I saw, you don’t have to stray very far from the main road through the park (Highway 240) to see amazing rock formation. The Door, Notch, and Window Trails at the East end of the park were the busiest areas, but also the best short hikes. I visited the park on a Thursday shortly before Memorial Day. There were very few people in the park. Around sunrise and sunset the only other people I saw were fellow photographers. After living on the East coast for a few years, I found it refreshing to get back to the Dakotas and remember what openness feels like. I don’t remember much about the weather, so it must have been good. I remember that it didn’t rain during my time in the Badlands, because it rained during every other stop on my trip. I had my jacket on but don’t remember it being overly cold. I stayed just up the road from the park in an Econolodge in Wall, SD. Wall is an interesting place; a tourist trap for sure. For 100 miles east or west along the Interstate, you’ll see billboard after billboard reminding you of how close you’re getting to the Wall drugstore. Wall is a good jumping off point. It’s a 10 minute drive from the west entrance to the park and the hotels are reasonably priced. There is camping in the park near the Visitor Center though I didn’t explore that option. There a number of burger joints, steak places, chain restaurants, and other options in Wall. I ate a bison burger there. There is no shortage of choices. The hardest part will be finding a place to park near downtown. I spent around 36 hours in the Badlands area, including the time I spent in Wall. This makes me a bit of an outlier because 83% of people stay less than 1 day (at least according to one NPS survey from 2000). I drove up one afternoon from Wind Cave National Park, spent the whole next day, stayed the night, and then left shortly after sunrise the following morning. I feel like I saw most of what I wanted to see. There wasn’t anything, in particular, I wanted to see. I decided not to go on any long hikes and for the most part stayed near the overlooks. The day I arrived in Badlands National Park, I woke up in Custer, SD, almost 2 hours away. I spent that morning in Wind Cave National Park before slowly making my way north and west through Custer State Park. I arrived in Wall, SD in the late afternoon, checked into my hotel, and got something to eat. It was an hour or two before sunset when I finally made my way through the Badlands entrance gate south of Wall. I drove the park road as far east as the Prairie Winds Overlook looking for a nice landscape with the western sky as a backdrop for sunset. It was getting close to sunset by then so I turned around and headed back to the Conata Basin Overlook (below left). I timed it well and reached the overlook just as the sky was starting to catch the colors. I spent about 45 minutes at the overlook trying out different compositions. Once the sun dropped below the horizon I jumped in my car and drove west along the park road to the Yellow Mounds Overlook (below right) hoping to get photos from one more location. It was getting pretty dark by then so I tried some light trails with the few passing cars that were still out that late. Then I made the short drive back to Wall for some sleep. I slept through sunset the next morning, got breakfast at the hotel, and didn’t get to the park until after 9:00 AM. Once again I started driving the park road looking for photo opportunities on a grey, overcast day. I stopped at some of the overlooks I had driven by the night before. There were impressive views and the overcast kept the harsh shadows to a minimum. I tried to cut out the sky where possible. I stopped at the Prairie Winds Overlook. 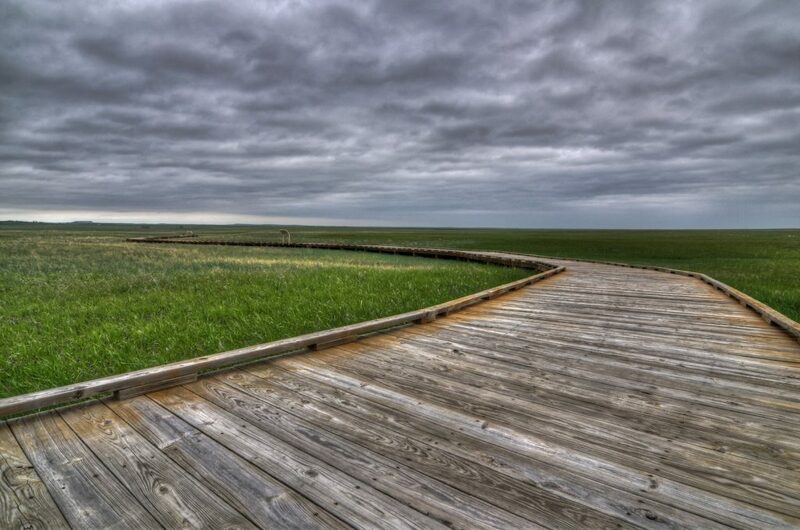 Living in DC, I miss flat prairie land. I drove the entire length of the park and stopped to hike the short but big payoff Door, Window, and Notch Trails. The Notch Trail is a 1.25 mile out-and-back hike that winds through one of the eroded canyons. The trail ends at a cliff between two spires (a notch). All of the moving air was being channeled through that notch and it was windy as hell up there, so I didn’t stay long. I hiked back to the starting point and then walked the Window Trail which is barely long enough to qualify as a trail. It too leads to a notch carved out in the eroded landscape and it overlooks a vast desolate red wasteland. This is the kind of landscape people think about when they think of the Badlands. Finally, I walked the Door Trail. Another very short trail that leads into the desolate red wasteland I was just talking about. 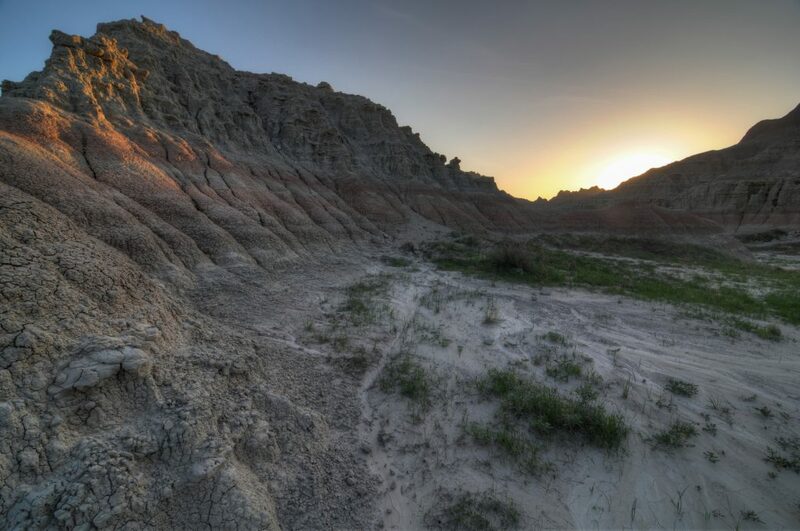 Here you can get right into the thick of the Badlands. I decided that this was where I wanted to spend sunrise the next morning. I explored a little bit to try to find a specific spot and I found it, just a bit past the “End of Trail” sign where the trail abruptly ends in a series of cliffs. I got back in my car and drove North, out of the park, on Highway 240. I passed over the Interstate where the highway turns into a dirt road (County Road CH 8) and kept on driving. I was hoping to find abandon farm buildings, barns, country churches, and grassland. I didn’t find much of any of that, but I did get some amazing clouds as the morning’s overcast started to break up. After about 20 minutes worth of dirt road, I turned around and headed back South and back into the park. I still had time to kill before sunset so I stopped at the Cliff Shelf Nature Trail and walked around for about 30 minutes. Finally, for sunset, I headed to an open field across from the Visitor Center. One of the best photos I’d seen of the Badlands in my research before coming was taken there and I was hoping for some of that same magic. I didn’t quite get it. By that point, all of the clouds had burned off and I was left with colorful, yet plain skies. After doing my best with the sunset, I made the long drive back to Wall along the park road. About halfway back, I saw several cars parked at the Panorama Point Overlook. It was odd because it was late and I hadn’t seen anyone for a while. I pulled in to see what they were looking at and as soon as I got out of my car I saw the huge, full moon. I had spent so much time looking West at the sunset that I had forgotten to look behind me. I grabbed my tripod out of my car and snapped a few photos. I vowed that, in the future, I would not be so focused (pun intended) on what I was doing to notice what was around me. After that, it was back to Wall and to sleep. I woke up early the next morning because I wanted to make it all the way to the opposite end of the park, to the Door Trail, by sunrise. I was driving East after that and didn’t want to go back to Wall, so I packed up my things and headed out in the dark. I hiked out in the treacherous door region in the dark with my headlamp on, set up, and waited about 20 minutes for things to get light enough to start taking pictures. Another group had timed it better than I did and arrived right around sunrise. I spent about 40 minutes taking photos before wrapping up my photo tour of North and South Dakota parks and making the 6 hour drive back to Bismarck, ND. I accomplished most of what I wanted to in the Badlands. The next time I visit, I will hike the Castle Trail to see more things away from the road and overlooks. I will also drive into the more remote Southwestern portion of the park in search of unique photo opportunities. All-in-all though, I would say 36 hours was about right for a casual been-there-done-that sort of trip. As I mentioned, I was inspired by this photo of the park. I explored the area where that photo was taken and tried to get something similar but it didn’t quite pan out. If I’ve learned anything in my travels, it’s that you are often at the mercy of weather when it comes to dramatic landscapes. The only way to increase your odds is to spend more time in an area and I did not do that on this trip. Maybe next time. 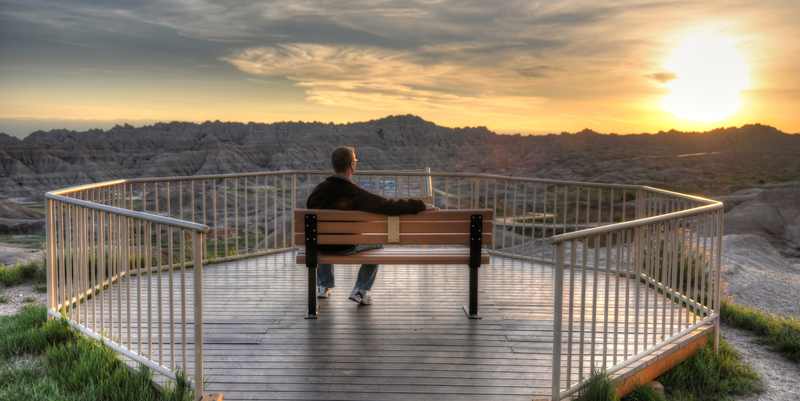 Badlands National Park on NPS.gov – Get information straight from the people who know best. 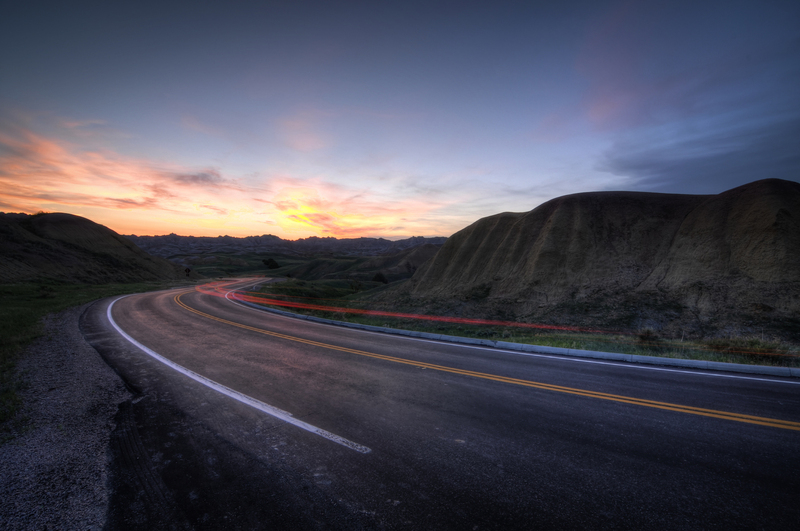 My Badlands National Park Gallery on Flickr – A collection of my photos from this trip on Flickr.